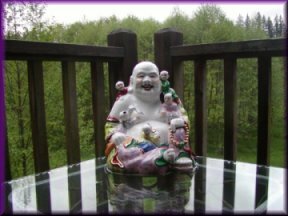 My mother's porcelain Buddha, clad in pink pyjama bottoms and an open yellow kimono, festooned with Chinese symbols, sits on a glass-topped end table out on my cedar deck, high above the pasture and overlooking the river beyond. The deck has become a garden of sorts, with its four large terra cotta pots, with various herbs planted in them, resting on the backs of strategically placed small red clay lions. Little "feet" to protect the smooth cedar from water damage. The hanging baskets of fuchsia, mint, pansies and other trailing blossoms attract humming birds. I have only had the Buddha since May. I found him out on my brother Jasper's patio, after he died. It was off in a corner behind tangles of Christmas tree lights and wobbly, broken chairs. We packed the porcelain Buddha carefully into a cardboard box, with towels, and placed it into the foot-well on the passenger side of the Land Cruiser. I cautioned everyone to be very careful of the Buddha. "It was my mother's," I told those who had come to help me pack out a dead brother's apartment. A brother who had died of pneumonia, the day before Mother's Day, because his girlfriend was too stupid to call 911. The girlfriend who wears my mother's clothes, even though they were not willed to her. My mother's elegant dresses, and hats, and gloves. My mother's silken lingerie. Her scarves, and shoes, and leather purses. Her perfume. A mother who died too young. A mother who left before I got a chance to know her. Later, at home, as we unpacked the cars and moving van, Glenn with his round belly, hanging over his brass belt buckle, took one look at the Buddha and loudly announced, "This will look great in my room. I have just the place for it." I couldn't help but mouth the words, "Mini-Me,” as my eyes rolled heavenward. They looked like twins, Glenn and my mother’s Buddha. When no one was looking, I took my mother's laughing, smiling Buddha, with the children crawling all over him, tickling him, to my studio. I locked the door behind me, climbed a flight of stairs, and took him out to the wooden deck. I placed him in the Southwest corner, below the rail, and watched the sun throw slanted shadows across his face and bare belly. Later, we brought my mother's glass topped dining table and two white wicker chairs up. They seemed, in a feng shui moment, to want to live in that same corner, so the Buddha, with his laughing belly, and red lips, was moved to the Northwest corner of the deck, with his yellow kimono clad back, to the spinney of Alder trees and the singing river beyond. The next day, when we were arranging my mother's leather furniture, coffee table, and glass cabinets, in the living room, of my house, on the Stillaguamish River, the house my husband and I bought to retire to, the house we bought before we knew he also would die so soon; I found an iron and glass side table in the things we were unpacking, which I spirited away and secretly brought up to my deck. I placed it in the corner and carefully set the Buddha atop the fragile glass. The glass I had cleaned with vinegar and newspapers, the way my mother's mother had taught me, the glass that shone in the late afternoon sun. I planted all the seeds I had brought with me, here to the Pacific Northwest from my home in Southern California. I sowed them in flats, and pots and Tupperware and anything that would hold the fragrant, crumbles of dark brown planting soil. I even placed a cosmos seed in a spice box full of earth, and set it like some special offering, in front of my mother's happy Buddha. Those red lips seemed to smile even broader. The rains came, and the tiny seeds began to sprout. The herbs began to bloom and flower, and my deck came to be called "My Buddha Garden." Now, there are small terra cotta flowerpots all along the railings, overflowing with columbines, and cosmos and Canterbury bells, and nasturtiums and geraniums. The bees come to cross pollinate the flowers and the hummingbirds come daily to taste the nectar in a stained glass humming bird feeder, and to watch the porcelain children tickle the laughing, smiling Buddha. The scarlet runner beans grow up the bean pole tipi I erected in the wildflower garden below, they climb up the Alder poles, just to sneak a peek at the dancing eyes of the laughing, smiling, happy porcelain figure on the glass topped table in My Buddha Garden. I thank my mother for this belated gift and for the joy she always brought me. Then I relax, in her white wicker chair, with the rose chintz cushions, at my glass-topped table, and feel her spirit all around me, as the bees hum and the river sings.